Description of "Every Muslim is NOT a terrorist"
Sanjeev Newar: Sanjeev Newar is the founder of Agniveer. He is the brain behind all major Agniveer's initiatives. He was the first person in world to predict the role of Zakir Naik in future terror acts back in 2010 which is now being accepted by intelligence agencies worldwide. Has miraculously accurate foreseeing capabilities vis a vis terrorism. The only genius, who understands Islamic terrorism in India inside out and the way forward. A data scientist by profession. His risk management products have been named in top 20 of world for 2014, 2015, and 2016. He is the only Indian (and Asian) to have ever made to this list. He has been behind several inclusive and encompassing tech innovations for agriculture, defense, food security, energy security. He is a mentor to several eminent young scientists of country. He is the most popular writer on Kashmiri Pandits on Quora. Sanjeev is an alumnus of IIT Guwahati and IIM Calcutta. Vashi Sharma: Vashi Sharma is the Head- Operations at Agniveer. He is the force behind Agniveer's crusade against terror. He is second to none when it comes to understanding Jihad, fanaticism, Islam, Islamism and geopolitics. Nightmare for hit and run Jihadi cyber-terrorists as well as fanatics on ground. Has risked his life for bringing the youths back to mainstream by debating Mullahs even in wahabi mosques. He has unbelievable record in de-radicalization of youths, specially those misguided by fanatic clerics like Zakir Naik. Has freed thousands of people from the Jihadi clutches and brought them back to humanity. He is a respected energy scientist with numerous international Journal publications. He is a doctorate from IIT Bombay and a scientist with Ministry of New & Renewable Energy. 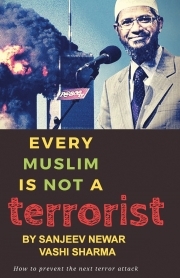 Reviews of "Every Muslim is NOT a terrorist"